A sphere of polyphonic chats, loosely knitted by members of Shin's seminar. 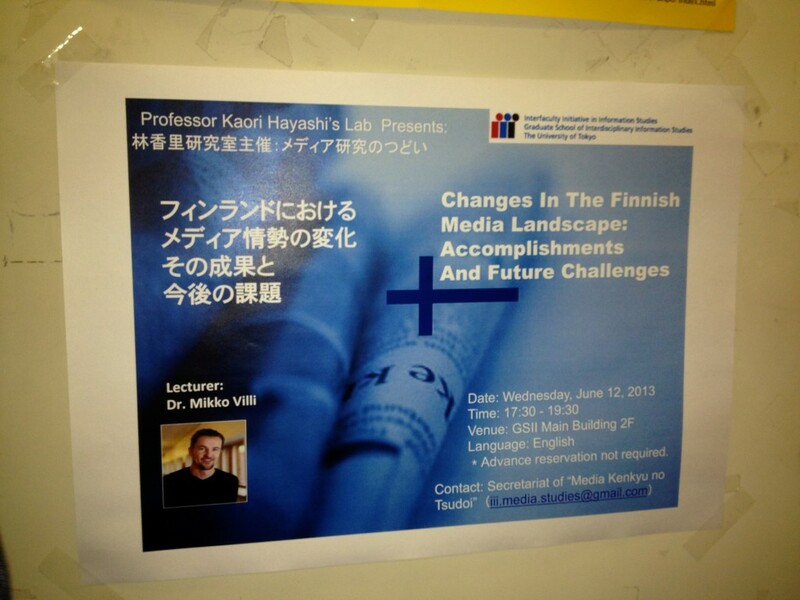 After 9 months stay (October 2012 to June 2013) in the Shin Mizukoshi lab, Dr. Mikko Villi had gone back to Helsinki. He has been a wonderful member of our research community and also of our drinking community! Now, he became a lecturer at the Media and Communication Studies, the Department of Social Research, the Faculty of Social Science, the University of Helsinki. And the director of the Communication Research Centre CRC in it. This is the poster of his research meeting in the Kaori Hayashi & Co., iii, the University of Tokyo. Mikko-san, please keep in touch, and take care. I don’t say Sayonara to you. We will develop a collaborative research project from now on, and, actually, I will meet you very soon. この記事はUncategorizedに投稿されました. このパーマリンクをブックマークする。 コメントは受け付けていませんが、次の URL へトラックバックを残せます: トラックバック URL. Copyright © 2019 Biotope Salon All Rights Reserved.